The Queen takes audiences behind the scenes of one of the most shocking public events of recent times – providing an illuminating, acidly funny, yet deeply affecting, dramatic glimpse into what happens in the corridors of power when tragedy strikes. The setting for this fictional account of real events is no less than the private chambers of the Royal Family and the British government in the wake of the sudden death of Princess Diana in August of 1997. 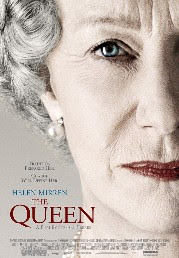 In the immediate aftermath of the Princess's passing, the tightly contained, tradition-bound world of the Queen of England (Dame Helen Mirren) clashes with the slick modernity of the country's brand new, image-conscious Prime Minister, Tony Blair (Michael Sheen). The result is an intimate, yet thematically epic, battle between private and public, responsibility and emotion, custom and action - as a grieving nation waits to see what its leaders will do. Well, perhaps I should've read the write-up a little more closely before I watched it - the trailers didn't really let you know what you were in for, except that Helen Mirren was brilliantly cast and made-up. After watching, I'm still not really sure what the point of it was ... The Peeb said that she wondered "if it was commissioned by Tony Blair" - pahahahahaha! I dunno, it's a little dicey doing true-life stories of such famous people ... there's the obvious comparison between the actors and their real-life counterparts. And while they clearly put huge effort into making Helen Mirren looking the part (except for her nose and I didn't think her accent was "pointy" enough) they clearly forgot the rest of the cast ... How they managed to cast that woman as the Queen Mother escapes me completely and even the guy playing Charles was only vaguely similar, at certain angles. Otherwise, I think the Queen herself might've commissioned it ... and I did feel sorry for her at the end of it. She is after all, still a person just like the rest of us. And since we're talking about the Queen, I'll fill you in on some related family history. Before she was Queen, Elizabeth came out to South Africa (in 1947 with her parents, it was her first official visit overseas) and while she was here, she happened to stay with my Great-Grandparents, Mom Burton & Bill. My grandmother, Ron, and her brother & sisters were teenagers, not that much younger than the future Queen herself. I will have to get the full story (again) from my Great-Aunt Jen next weekend ;) But still, what a fun story! And then this morning we had our first Monthly Ladies Breakfast. It's a new project I'm starting at work this year. We have a People Forum (it's a bit like an SRC) at work and I'm involved in that too, but I think it's really important for the girls in such a male dominated industry to make an effort to bond & be friends, at work at least! Especially since we're all generally in such different departments and have to go out of our way to interact during the average work-day. So anyway, I've started these Monthly Breakfasts at our local restaurant and although it wasn't all that well attended, there was really positive feedback and I have such great ideas for girls-only team buildings etc. I'm really looking forward to this! We had a similar thing at a company I worked for back in Cape Town (Hi to all those old Grapevine Girls!) and it was such fun. Quite a few of us actually still keep in occasional contact. Nice.